CMOs are facing incredible pressure to drive revenue for their companies and prove digital marketing ROI. Research shows that 70 percent of marketing leaders believe their organizations expect marketing to be the primary driver of revenue and business growth. Furthermore, CMOs that don’t perform will soon be on their way out. Forrester predicts that 30 percent of CMOs will be shown the door in 2017. In order to meet these growing expectations around revenue and growth, marketing leaders need to have solid strategies and tools in place to help them demonstrate the value that marketing brings to the organization. Here we’ve gathered some best practices to help make it easier for you to prove digital marketing ROI, and validate that you’re a leader worth keeping. 1. Connect performance data to business outcomes. In the CEO’s mind, marketing’s value to the organization won’t be judged by how many likes your Facebook page earns, or how many Twitter followers you have. Rather than focusing solely on vanity metrics like these, you’ll need to link your performance data with business outcomes. Depending on your organization, these outcomes could include increasing revenue through customer acquisition and growth, or increasing wallet share for existing customers. But connecting performance to outcomes is easier said than done. 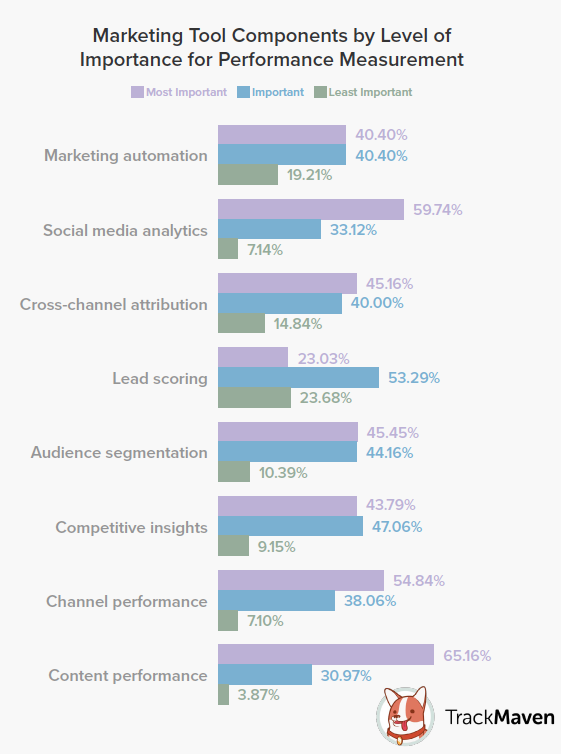 TrackMaven research confirms how challenging it is for CMOs to make the connection to outcomes. Our 2017 Marketing Leadership Survey shows that even though 66 percent of marketers think it’s easier or much easier to prove marketing impact, only about 28 percent consider themselves very effective at demonstrating the value of marketing efforts internally. Most (69 percent) say they’re only somewhat effective at demonstrating value. This disconnect certainly doesn’t exist because marketers don’t have enough data. The problem is, there’s so much data, they’re not sure how to make sense of it all. That said, marketers do have an idea about what they need to get started. According to our survey, marketers say the two most important components needed to measure performance are content performance measurement (65 percent) and social media analytics (60 percent). If marketers want to successfully connect this performance data to business outcomes, they’re going to need the right tools to do so. A marketing analytics platform that performs digital marketing attribution is a good place to start. Attribution can help you link every content and social activity to revenue. 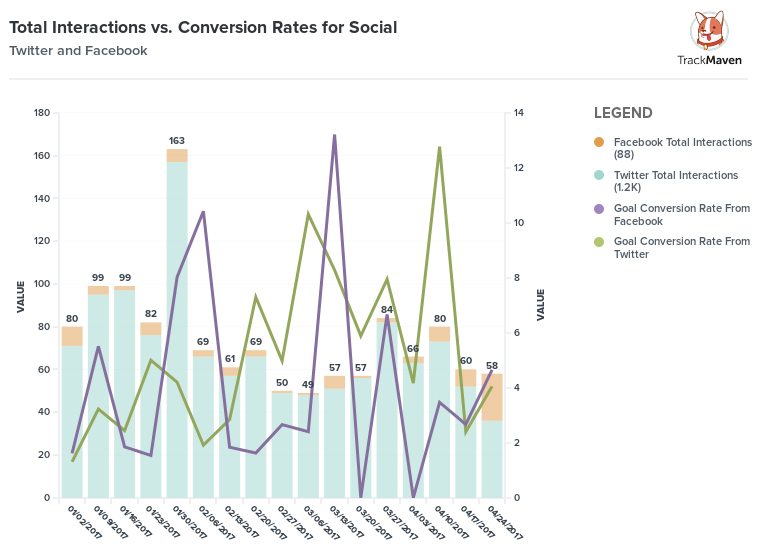 For example, if you want to know which channels are most effective in converting new customers, you can track metrics such as conversions versus number of interactions by social channel. 2. Understand the difference between goals and KPIs. This might seem like basic knowledge, but the truth is, many marketers get confused about how goals differ from key performance indicators (KPIs). It’s important that you and your stakeholders understand how these are defined so that you can set clear expectations, prevent miscommunication and see the best performance gains. Let’s start with goals. Goals are the outcomes you want to achieve. For example, one of the goals of your organization might be to increase revenue or grow your business in some other way. On the other hand, KPIs are the key metrics or measures you use to determine whether or not you’re making progress toward that goal. Here’s a quick example and illustration we borrowed from Internet Intelligence: Let’s say your company goal is to obtain 20,000 new subscribers this year. To support this goal, you might run a campaign that aims to recruit 2,000 new subscribers. Within that campaign are lots of activities that occur on different channels, including ads, emails, site visits, and conversions. By tying KPIs to those activities, such as those related to traffic, engagement, and conversions, as well as monitoring those KPIs with digital marketing campaign tracking tools, you can get a good idea of how you’re progressing toward your campaign goal, as well as the overall company goal. 3. 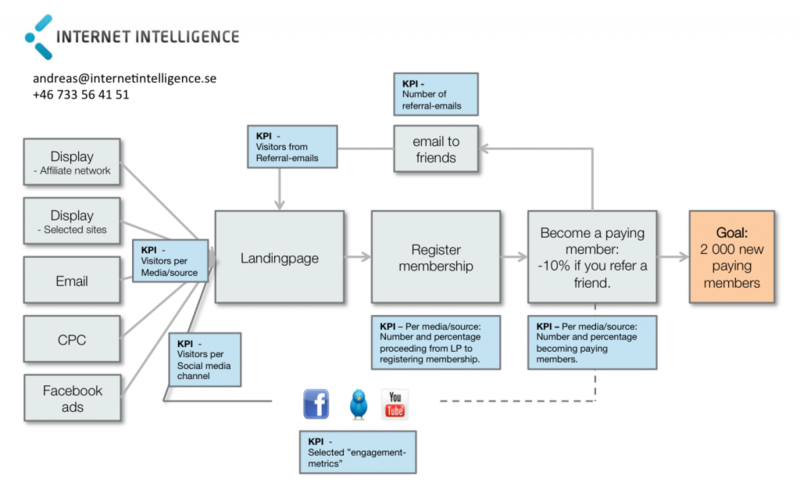 Know when to use leading vs. lagging metrics. All metrics are not created equal. One thing to consider when determining which metrics are right for you is the difference between lagging and leading metrics. Lagging metrics are those that happen after the fact. Basically, they’re the long-term results of our marketing campaigns, and the ones most marketers like to work with because they’re easy to see. These could include things like revenue influenced by marketing activities, closed business, lead volume, and lead conversions. Lagging metrics are valuable because they show us where we’ve been and give us a record of progress over time, but they don’t give any indication of where we’re going. Leading metrics, on the other hand, are those that predict a business outcome. They’re typically harder to measure than lagging metrics, and are considered your business drivers. Put another way, leading metrics are the markers of progress toward your KPIs, and could include metrics around social media engagement, website traffic or key form conversions, among others. These are measures that can be regularly optimized on each channel to help you achieve your goals. And, because these measures help you better understand what kind of revenue levels to expect in the future, you can use them to track return on investment in real time. Each type of metric has its strengths and limitations. That’s why they’re most effective when used together. For example, if you focus only on increasing revenue (lag indicator) without using lead indicators to measure progress along the way, you’ll have no idea whether or not you’re getting closer to your goal. Worse, you’ll miss any early warning signs that you’re failing to meet that goal. That’s why it’s important to continually assess your KPIs so you always know where you stand. 4. Convince stakeholders which metrics are most valuable. Shifting your marketing organization to one that is revenue-driven will likely take some convincing. After all, many people on your team are likely accustomed to using vanity metrics because they’re so readily available. And frankly, showing that your Facebook page is now up to 10,000 likes sounds like a great accomplishment. However, if those Likes aren’t translated to dollars, your CEO, CFO, and other executives could care less. They want to see how you affect revenue, cash flow, and margin. They want you to prove how marketing helps increase profits and grow the company. That’s why getting everyone on board the revenue marketing train is so important. To do this, show everyone on your team how what they do is contributing to company goals. Provide them with a digital marketing ROI dashboard so they can easily access and monitor their progress regularly, see where they’re coming up short, and come up with strategies to get back on track. Then, share these dashboards with other executives, being sure to highlight digital marketing ROI metrics so they can clearly see the value your organization is providing to the overall business. When you’re able to do this, you can ensure that marketing is firmly positioned as a profit generator, rather than a cost center — and that you’re firmly positioned to lead your company’s marketing efforts for years to come. To find out about more about how today’s leaders prove digital marketing ROI, download your free copy of the 2017 Marketing Leadership Survey today.